Our youngest daughter Grace joined me tonight to work on her senior project. She has been taking a photography (film) class and her task is to capture the essence of Maryland. So. following in her fathers footsteps, we set out to get a few pictures of the "land of pleasant living". We left the dock at around 6:45 to sunny skies and a light breeze, despite a forecast of thunderstorms. Mild Bill was already anchored up at the spot, so we pulled up along side of him and set the anchor at little after 7. 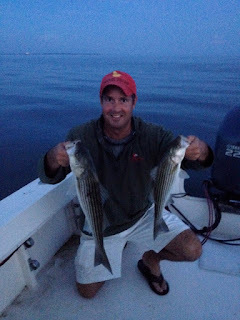 It was a perfect topwater night, with the bay like a mirror, due to a slack tide. Bill picked up the first fish of the night around 7:30 and that was it until the sun had set. In the meantime, we counted a total of six boats that motored up and gave it s shot. One by one they bugged out and by 8:15 we were all alone. We had planned on hitting the Thomas Point lighthouse for a quick pic, but Grace agreed to forego that exercise since I assured her that things were about the break loose since the boat had finally begun to swing around indicating the changing tide. The last boat was still within sight when I had my first blowup and brought aboard a 16 inch fish. Just like clockwork, all hell broke loose. Grace had a huge blowup and went down to her knees to keep from flying over the bow rails. I looked up and knew instantly it was a beauty. After a fight that made this dad proud, I netted a very fat and healthy 25 inch fish. It was non stop action for the next half hour, with at least 10 fish boated. We even had a father/daughter double. So I was able to pass on a few lessons to one future "plugger". 2. Be quiet when approaching a shallow water spot. Every one of the six boats came in with their loud smelly 2 stroke engines a blaring. 3. Be patient. We just had to wait out the tide. 4. Listen to your elders. Nice evening on the water Rich! It certainly wasq one to remember. Always nice when one of your daughters gets a fish.